Every year Olympia Students that attend classes at the Bloomington Area Career Center are offered a chance to compete at the state level in SkillsUSA competitions. SkillsUSA is a national membership association for students who are preparing for careers in trade, technical and skilled service occupations. SkillsUSA offers local, state and national opportunities for students to learn and practice workplace skills. Each competition has different entry requirements. Most competitions require that students are a member of the participating school, and studying a similar program, either are on a team, or pass a State Qualifying Exam and are able to participate in the competition. This year, OHS sent four students to SkillsUSA: Lyndsey Sebok, Kaylee Withey, Kyle Cheeseman, and Katarina Dickhut. Oly students will be competing in four competitions: Health Knowledge Bowl, Medical Terminology, Job Skill Demonstration A, and Fire Fighting. These four students competed in Springfield April 19-21. 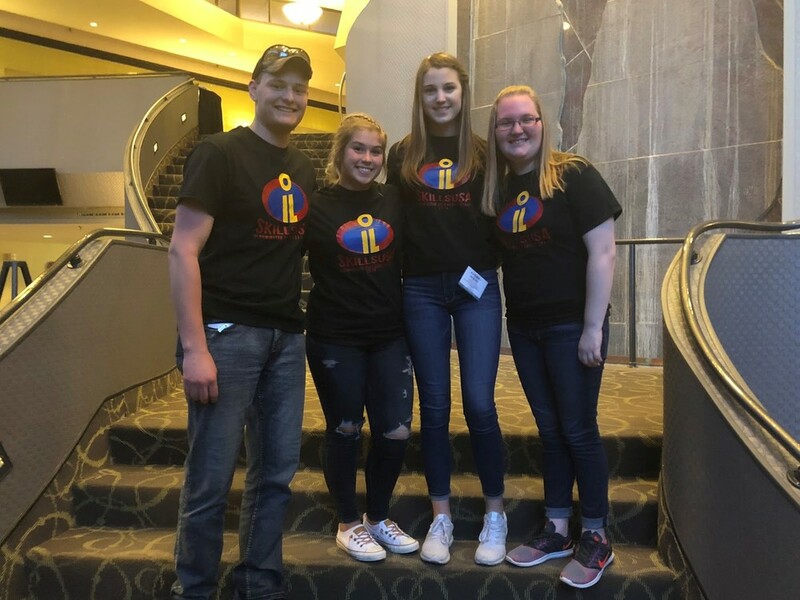 Katarina Dickhut placed 20th in Job Skill Demonstration A, Lyndsey Sebok and Kaylee Withey as part of their team placed 5th in Health Knowledge Bowl and Kyle Cheeseman placed 7th in Fire Fighting. Advancement in competitions depends on the competition that the student participates in. Most competitions have students complete a hands on skill, a job interview, and a resume that shows their skills and talents in that trade. The student receives a state ranking. If the student places 1st in State, they are they eligible to represent the State of Illinois in the National Competition in Louisville, Kentucky over the summer against all of the other 1st places winners across the nation. Along with advancement, competitions give prizes to the 1st place winners. Common prizes are scholarships, and supplies most used in that field.